Glaucoma is a disease of the optic nerve, wherein the anterior part of the nerve, the optic disk, undergoes posterior distortion (cupping and excavation) along with loss of the nerve fibres. This leads to peripheral and finally total visual field loss. The major risk factor is elevated IOP, which along with cerebrospinal fluid pressure (CSFP) largely determines the pressure gradient and forces acting upon the connective tissue, nerve fibres and vessels in that region. Constitutive vulnerability factors like myopic connective tissue thinning play a role in determining the effect of these forces and together broadly form the theoretical planks of the “mechanical” theory of causation. Vascular factors are known to be involved given the common occurrence of disk rim haemorrhages and retinal venous occlusions in the disease. Considerations of these and possible arterial changes have led to a “vascular” theory, although more recent work suggests that features of these two theories are inter-linked. The classification and treatment of glaucoma is currently determined largely by the mechanism of IOP elevation. Given that aqueous production is relatively constant, IOP is largely determined by the rate of aqueous egress from the eye. The passage of aqueous humour within the eye is critical for altering the configuration and function of the drainage angle. 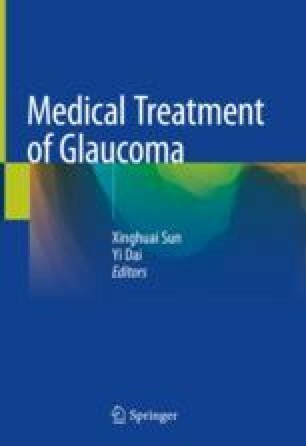 The rate of aqueous outflow from the eye via the trabecular meshwork and ciliary body through small channels vitally affects IOP stability and control and is a key factor in glaucoma causation. National Health and Medical Research Council Australia.